Mazars Grange cricketers start the quest for their third Murgitroyd Masterton Trophy success in a row this evening (6pm) when they welcome Morton to Stockbridge. The Capital outfit won the local Twenty20 event in 2013 and 2014 and then went on to lift the national trophy on both occasions too. 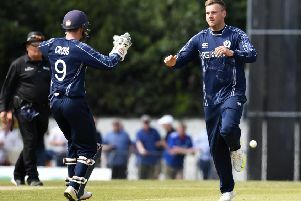 The tournament features CSL Eastern Premiership sides Grange, Carlton, Heriot’s, Watsonians and RH Corstorphine, and Baillie Gifford ESCA Championship sides Marchmont, Murrayfield DAFS, SMRH, Edinburgh, Holy Cross and Stuart&Stuart Penicuik. The 16 team event is completed by East One sides Boroughmuir, West Lothian, Edinburgh South and Edinburgh Accies plus East Two outfit Morton. Morton have started their league season with two wins, but know they will be massive underdogs heading to Grange. Still, it is a great chance for their players to play at Portgower Pace against some top quality cricketers. Tonight, Holy Cross are also set to play RH Corstorphine in first-round action. Round one continues tomorrow evening with Edinburgh South hosting SMRH and Carlton scheduled to travel to take on Edinburgh. The first round is due to be completed next week with all ties to be played by May 15. The final is set to be on July 3 at Grange Loan.